The 2018 FIFA World Cup had people talking before it even started, but the number of upsets in just the first few games have kept fans more on their toes than ever. And with so much more to come, Russia 2018 is proving to be one of the most exciting World Cups to date. Iceland, a country with a mere 330,000 residents, made its first-ever World Cup appearance against Argentina, the home team of Lionel Messi, arguably the world’s best soccer player. But what seemed like a clean-cut game, as in Argentina winning by a landslide, turned into a massive upset: A draw. Iceland, the smallest country in this year’s World Cup, turned out big against Argentina. After Argentina’s Sergio Aguero netted one for his team, it seemed like Iceland’s chances at a draw or victory were already done. But Iceland’s Alfred Finnbogason managed to sneak the ball into the back of the net, giving the team a little more faith. Things only got better when Messi flubbed a penalty kick about halfway through the second half. Iceland’s Hannes Halldorsson took a literal leap of faith and jumped to his right to block the shot. He succeeded, and Iceland gave Argentina a serious run for their money, ending the game in a 1-1 draw. Things only got worse for Argentina, who went on to lose 3-0 to Croatia. The draw with Iceland and loss to Croatia dropped Argentina to 30-1 odds, making a World Cup win a steep climb — and likely a pipe dream at this point. Joe Sampaoli, Argentina’s manager, begged for the fans’ forgiveness after Argentina’s tough loss. Mexico is a team known to have skill, but nobody expected the team to take a victory from Germany right at the beginning of the World Cup. Germany, the defending World Cup champions, hadn’t lost their World Cup opening game since 1982. But Hirving Lozano’s goal in the first half helped set Mexico up for a huge win and an even bigger upset. In a post-match press conference, Lozano credited his coach for the surprising victory. “He told us … To come out 100%,” Lozano said. It set the bar high for Mexico’s remaining World Cup games and left Germany fighting for a comeback. Brazil, the only team to play in every single FIFA tournament and the team with the most-ever World Cup titles (five), did not expect to have a draw with Switzerland right as the cup opened. But just a few hours after Mexico defeated Germany, Brazil fell to a draw with Switzerland, creating yet another shock that would affect the World Cup outcome. 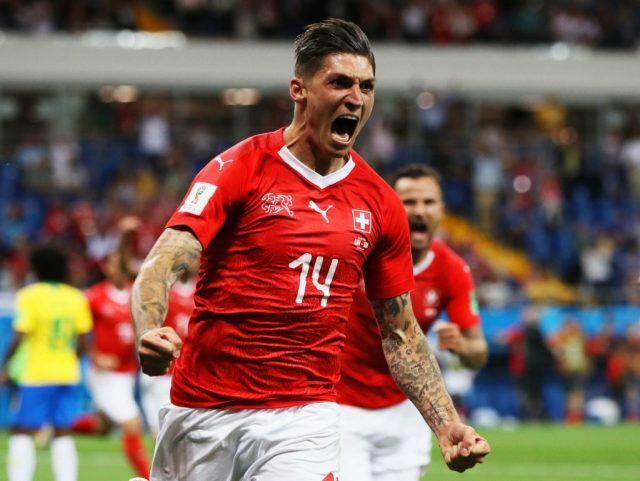 Philippe Coutinho scored the first goal for Brazil, but Switzerland’s Steven Zuber answered, leaving the game tied 1-1. Despite complaints that Zuber had shoved Brazil’s Miranda just before taking the shot, the goal counted, and the game ended 1-1. Only 18% of viewers favored Japan to beat Colombia, so the majority of those watching were shocked to see Japan win. Thanks to Japan’s Yuya Osako, the team rose above Colombia in a 2-1 victory. Osako set up Japan’s first goal and scored its second. On Colombia’s end, a red card to Carlos Sanchez, who blocked a shot on goal with his arm, left Colombia playing with 10 men for the majority of the game. Colombia down a player and Osako stepping up made for an ideal situation for Japan, who took home the win. And though the World Cup still has a while to go, this likely won’t be the last of the upsets.